Schillaci says EV customers say they "will never go back to a vehicle powered solely by an internal combustion engine." 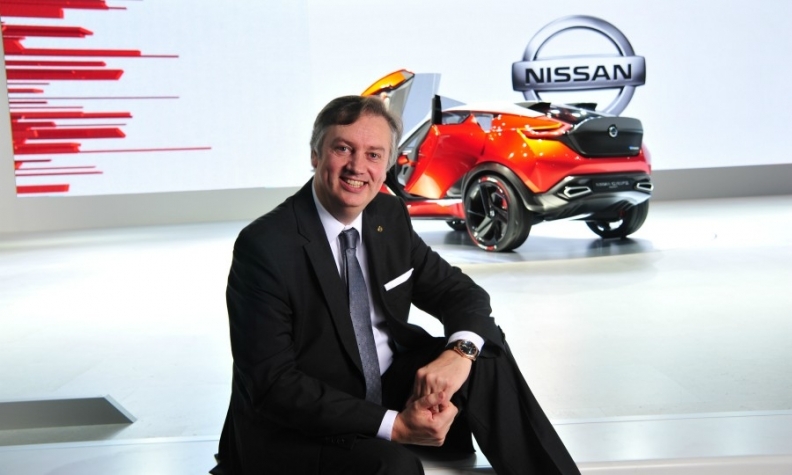 Along with being Nissan's global sales and marketing boss, Daniele Schillaci heads the automaker's zero-emissions vehicle and battery business, which means he plays a prominent role in the Japanese automaker's electrification and future mobility plans. The former Renault, Alfa Romeo and Toyota executive, who joined Nissan at its Yokohama headquarters roughly two years ago, says that Nissan's EV customers have told him that all their future cars will have an electrified powertrain. He discussed this and more in an interview with Automotive News Europe Associate Publisher and Editor Luca Ciferri and Automotive News Asia Editor Hans Greimel. Global sales of electric vehicles are sluggish at best. Why? When we launched the Leaf eight years ago, EVs were seen as far off into the future. If you look now at what other automakers are doing, in many different segments, you clearly see that EVs are coming. Nevertheless, for EVs to become an established part of the market there needs to be an adequate recharging infrastructure and incentives to help customers with their higher starting price compared with a conventional model. Where there has been the combination of purchasing incentives and infrastructure development, such as in some northern European countries, EVs have achieved a significant presence. Would you agree that in many markets, including California, most EV sales are hollow? They are not bought by private customers because they like them. They are pushed into the market by automakers forced to comply with emissions regulations. I've recently spoken with Nissan customers in California and I strongly disagree. They love the idea of driving an emissions-free vehicle and they love the Leaf's acceleration. They say that after owning an EV, they will never go back to a vehicle powered solely by an internal combustion engine. If a new technology is only for legislative compliance and does not offer any clear benefit for the customer, it will probably fail. I saw true customer engagement. EVs make their driving more fun while benefitting the environment. It's a win-win combination that creates strong consumer satisfaction. There are rumors that the next Nissan EV will be a crossover. What can you say about that? SUVs and crossovers are a part of Nissan's DNA, so it makes perfect sense to also work on electrification for this part of the market, which is experiencing massive growth all over the world. What about a low-cost EV for China? In China, the EV market also requires entry models with an on-the-road range of about 100km and a price around $7,000 to $8,000 (about 6,500 euros to 7,400 euros). It is a difficult product and price proposition, but because this vehicle is important for China and China is important to Nissan -- we plan to sell 1.4 million units there this year -- we are working on it. Could China become the world's largest EV market? If you look at the 2016 figures, China was already No. 1 globally thanks to a 75 percent rise in sales to 256,000 electric passenger cars. Experts predict between 800,000 and 1 million units will be sold in China annually by 2020. With a broadening model offering, I think that is an achievable target. Main Challenge: Making Nissan's goal of achieving zero emissions and zero fatalities a reality. Several experts predict that the next battery technology breakthrough won't come until 2025. As Nissan's battery boss, do you agree? It is still a bit too early to say. The evolution of the electrode chemistry is already happening and a lot of tests are being done by different automakers and suppliers around the world. We see 2025 as a period when we will benefit from several improvements not only in battery technology but in the entire electric drivetrain. Big changes will probably happen after 2025. How would you define the Nissan Intelligent Mobility program that you lead? Although Nissan created today's volume EV market with the debut of the Leaf in 2010, the company was convinced that electrification would be just one piece of the future mobility puzzle, which also includes a strong connected car environment as well as a suite of safety systems to prevent accidents from happening. To put this into a short marketing statement: Nissan Intelligent Mobility is our vision for a future with zero emissions and zero fatalities. How is the program being rolled out? It is a progressive rollout. A next big step will be the new Leaf, that we will arrived in Europe, the U.S. and China late this year.